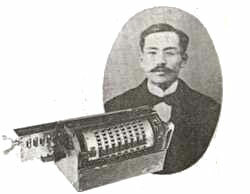 In his short life the Japanese inventor Ryoichi Yazu (1878-1908) was mainly interested in mechanics of flight and in 1890s designed one of the first airplanes, but remained best known for his invention of Japan's first mechanical calculator (in fact, there is another Japanese inventor, who patented a mechanical calculator several years before Yazu—Shohé Tanaka, but his device remained only on paper). Ryoichi Yazu was born on 30 June, 1878, in the village of Iwaya, near Buzen, Fukuoka, in the family of a village mayor. He attended primary and middle school in his home village and the city of Buzen. At the age of 16 he left middle school and moved to Osaka to pursue his interest in flight, studying mathematics and engineering at a private school. At the age of 22 Yazu returned to Buzen and began work on a thesis on the mechanics of flight. It is believed, that at the same time he got the idea for the calculating machine while helping with his father's clerical work, and conducted research on calculating machines. Two years later he brought the thesis Principles of Flight and a model of his mechanical calculator on a visit to the novelist and army physician Mori Ogai (1862-1922). Interestingly, Mori Ogai studied together with Shohé Tanaka in late 1880s in Germany (in 1908 Tanaka married to a relative of Ogai), so we may suppose that was informed about his works in the area of adding machines and shared his knowledge with Yazu. Anyway, Ogai was very impressed of Yazu, and wrote recommendations that led to a special research position at the Tokyo Imperial College of Engineering, where Yazu worked on the design of a propeller-driven airplane. In March 1902, Yazu applied for a patent on his Jido Soroban (automatic abacus) and completed a prototype, made entirely of metal. 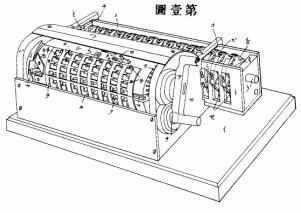 The patent (see the nearby patent drawing) was granted in January 1903, and in March a shop was established in Tokyo, where the first calculator in Japan (known as Patent Yazu Arithmometer) was manufactured. Interestingly, in 1912 the same device was patented in USA by one Doichi Yadu (an accidental resemblance of names?!) of Sudamura, Fukuoka, Japan (US patent 1029655). 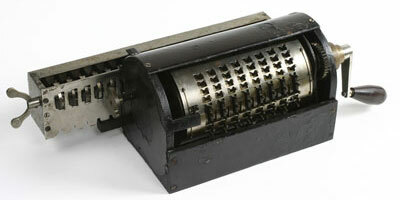 The Yazu Arithmometer was a manual desktop gear type calculator with pin-wheel mechanism, which performed decimal arithmetical operations (it may be used to add, subtract, multiply and divide), using a single cylinder and 22 gears with biquinary number setting (a mixed base-2 and base-5 number system, familiar to the users of Japanese abacus soroban). It was capable of arithmetic calculations up to 16 digits and carry and end of calculation were determined automatically. The price of Patent Yazu Arithmometer was rather high (¥250) for the time, but nevertheless more than 200 were sold, mainly to government agencies, including the Ministry of War, the Home Ministry, the Statistics Bureau, and agricultural experimental stations, but also to big companies such as Nippon Railway. The profits from the sales Yazu invested into his airplane research. Ryoichi Yazu died from pleurisy only 30 years old, on 16 October, 1908, in Tokyo. Later his father tried to improve the machine and to resume the business, but had no success.